Raumfahrt+Astronomie-Blog von CENAP - Blog: Astronomie - Aluminum may be key to making exosolar systems with water worlds Radioactive aluminum could control water content of planetary building blocks. Should we expect all the planets of an exosolar system to have similar levels of water? Mini-Neptunes. 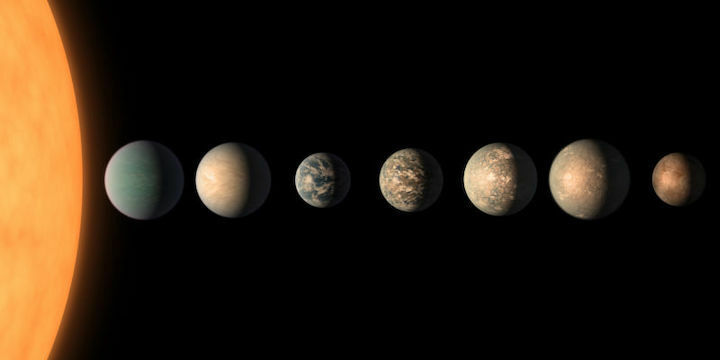 Super-Earths. There's a huge diversity of exoplanets out there, many of them unlike anything we have in our Solar System. So how does a single physical process—the aggregation of bodies within a disk of gas and dust—produce so many different outcomes? That's a question tackled by a paper in this week's Nature Astronomy. An international team of researchers has modeled the formation of planets early in the history of exosolar systems. And they find it's possible to radically change the water content of planets based on the amount of a radioactive element present in the material forming the exosolar system. The difference, they suggest, can determine whether a system is filled with ocean worlds or whether it winds up looking more like our own Solar System. We already have some idea of what sets the level of water on a planet. The material in a planet-forming disk is heated both by collisions among its material and from the inside-out by the star once it ignites. Different materials will freeze out at specific distances from the star, creating multiple snow lines for water, carbon dioxide, methane, and more. Depending on which side of the snow lines an exoplanet forms, it will have more or less of these materials. Of course, things aren't that simple. Modeling suggests that planets are built by the collision of smaller bodies called planetesimals, and gravitational interactions can move those bodies around the disk a bit. Gravitational interactions among mature planets can shift them around as well. Still, the physics suggests that there should be a general tendency of increasing volatile material on planets as you go farther from the host star. Except that's not generally what we see. We haven't fully characterized enough multi-planet exosolar systems to have a statistically robust sense of whether there's an inside-out increase in volatile materials (although we have identified some exceptions). But the exosolar systems we have examined often show a clustering pattern with a tendency toward watery worlds or dry, rocky ones rather than an ordered mix of the two. To try to understand what might be going on here, the research team ran a model of planet formation repeatedly, varying the conditions. The model started with a Moon-sized proto-planet and smashed a series of planetesimals into it—the size of these bodies was also varied systematically. Planets were started out at different distances from M- and G-type stars (Sun-like and smaller), with water content of the planetesimals set by this distance. The team ran 30,000 individual simulations for each set of conditions. On their own, these simulations did about what you'd expect. Inside the snow line, planets were smaller, drier, and rockier. Outside, where water would freeze out, larger icy bodies typically resulted. The authors then tested a hypothesis by spiking their models with some radioactive aluminum (and starting another 30,000 simulations for each condition). 26Al is an unstable isotope of the familiar metal, with a half-life—720,000 years—that means its decay can come during the process of planet formation. The isotope is formed by heavier stars, which end their existence in an explosion. Should the explosion place the 26Al into a star-forming cloud, it could reach its peak in decay right about the time that the planet formation process starts off. The simulations suggest that the heat generated by radioactive decay of this element can drive all the water off smaller bodies (up to about 50km in diameter). If there's enough of this element around, it can heat enough water off that the resulting planetesimals are smaller and rocky—in extreme cases, even water-free bodies. Systems that form with low levels of the isotope, by contrast, tend to have planetesimals with the amount of water you'd expect based on their distance from the star. These results were reflected in the planets that ultimately formed. Systems with lots of this aluminum isotope tended to form smaller, dry rocky bodies. Systems with low levels of the isotope formed more water worlds. The amount of this isotope is expected to be distributed unevenly within star-forming regions but evenly distributed within a planet-forming disk. The timing of planet formation can also matter, as a sufficiently large delay after a supernova would allow more of the isotope to decay before planetesimals form. This would explain the formation of systems where multiple planets seem to have similar levels of water rather than showing a clear divide at water's snow line. It can also explain why different systems can end up either wet or dry. But that isn't to say that this is a single explanation for everything. In our own Solar System, most of the inner planets wouldn't currently have the same level of water that they started with. Venus lost most of the water it might have had once the runaway greenhouse started; Earth would have lost it when the Moon-forming collision occurred; and Mars lost a lot of its water gradually as its atmosphere was driven off by the solar wind. None of these planets started as water worlds, but it's possible that similar processes could reduce a water world to a desert. Still, the idea has one testable consequence, as it predicts that exosolar systems will often see a number of planets with similar processes. But directly relating that idea to aluminum levels will be difficult, as we'd have to sample some of the rocks from the system to estimate its starting 26Al levels. And that's not likely to happen any time soon.